1 Family history. Varicose veins tend to run in families. 2 Age and weight. The older you are and the more you weigh, the higher the risk. 3 Hormonal change. Among women, hormonal changes associated with puberty, pregnancy and menopause can increase the risk of developing varicose veins, as can birth control pills and other drugs containing estrogen and progestins such as HRT. 4 Incorrect sitting position. If you tend to cross your legs while sitting, you may increase your chances of developing varicose veins. 5 Inactivity. You can help prevent or minimize vascular problems in the legs by getting regular physical activity – it promotes healthy circulation and can help discourage weight gain and obesity – and by avoiding long periods of inactive standing. Try to elevate your legs whenever possible. 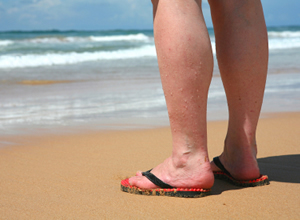 If you know you have a genetic predisposition to varicose veins it is even more important to take preventive measures to avoid them where possible. Ensuring good hormone balance with no oestrogen dominance symptoms is a start and rebalancing with bioidentical natural progesterone will help get that under control. A very old herbal remedy is also effective. Horse chestnut seed extract (HCSE) is widely prescribed in Europe for chronic venous insufficiency, a syndrome that may include leg swelling, varicose veins, leg pain, itching and skin ulcers. The active ingredient in HCSE is believed to be escin, a compound that helps support normal vessel wall function.